Ikebana is one of the most famed Japanese traditional arts, and traces its origin back hundreds of years. Ikebana was historically placed within the “tokonoma” alcove of the Japanese home. Now it is practiced in most of the contemporary world as an artistic decoration placed throughout the home. In its basic form, an Ikebana arrangement follows a fixed pattern: a triangle of three points representing Heaven, Earth and Human. From there, many other guidelines are taught depending on the flower and branch material used. Ikebana usually contains the foliage and flowers of the season at hand, used in their natural state, except when arrangers enhance the beauty with trimmings. All demonstrations and displays will be at the Japanese Cultural and Community Center of Northern California. The Ikebana Teachers’ Federation is a consortium of professional Ikebana teachers from the SF Bay Area that provides a forum for collaboration and cooperation in a friendly atmosphere. 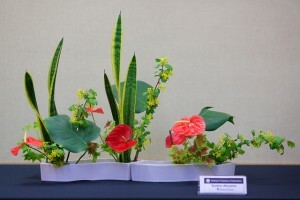 It is dedicated to its teacher members and to sharing the Japanese cultural art of ikebana to the community. We have been participating in the Cherry Blossom Festival from the beginning. For more information, please come and visit us at the JCCCNC, Issei Memorial Hall.